The noteCafe is recorded a day-to-day events and interesting Web pages and ideas, you can refer to later. With a rich search function and the narrowing function and the page list, you can find the purpose page quickly. 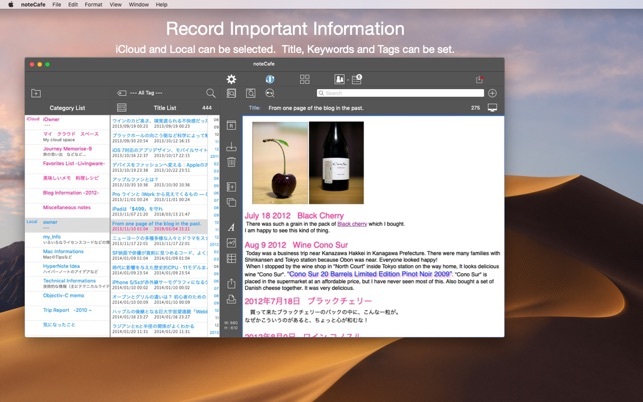 noteCafe supports iCloud and Local. Using iCloud, you will be able to share data between your iPhone, iPad and Mac. Supports meeting mode. Full-screen display of the pages registered in the list. • Localization is supported only for date formats of creation date and modified date. 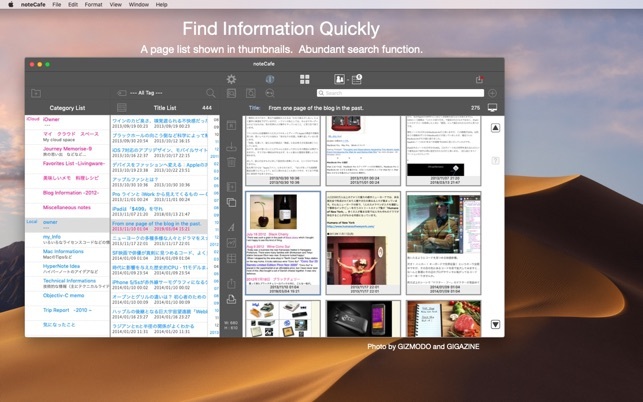 • Window information and menus are supported in English and Japanese. • In addition to text, you can attach images, movies, PDF, files (Such as iWork file). • The page conforms to RTFD format. • Title and keywords will can be attached to the page. • The tag can be attached to each page. • Category can create, edit and delete. • Page can be classified using the categories and tags. • The page list can be shown with thumbnails. • The preservation of data can use iCloud and Local. • File size to be stored in iCloud is limited to 30 MB. Local is limited to 50 MB. • Font, font color, font style, font size can be edited. • Headline can be set. • The image can be resized. • Search a pages that belong to a category. Search content is the text data in the page. • Search the title of a page belonging to a category. • Search for a keyword of a page belonging to a category. • Search further from search results. • By changing the date range for the creation date and modified date, you can filter down the title. • It supports auto save. • Lists and tables can be inserted. • HTML file can be imported. Multiple HTML files can be handled. • Supports the markup function. • Insert a blank image canvas into the page. You can use the Mark-up function. • Other pages can be referred. • Pages can be exported as a RTFD file. • By using the export and import function, you can share the page that you saved locally on the other device. • Deleted pages can be erased or recovery. • Supports the Share Extensions. 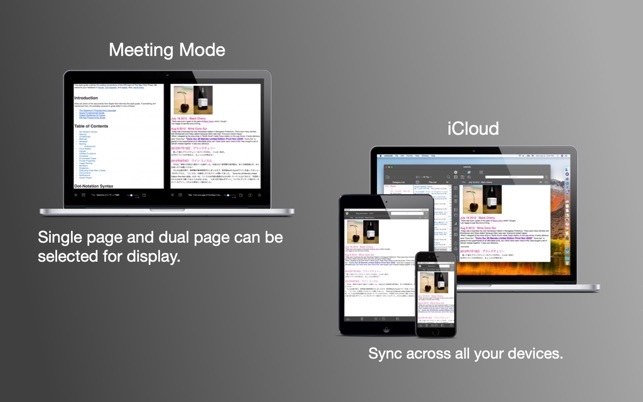 • Supports meeting mode. Full-screen display of the pages registered in the list. • Using the export and import function of noteCafe file, you can transfer the data of noteCafe to a new Mac. • When an index necessary for the operation of noteCafe is damaged by some kind of accidents, noteCafe can rebuild an index. • To read the file, use the application "noteCafe Stylo". – Various files can be read from arbitrary folders. – The loaded file can be saved in "noteCafe". – Categories, tags, keywords can be set when saving. – "noteCafe Stylo" is available from the App Store. - Full-screen display of the pages registered in the list. - Single page and dual page can be selected for display. - The page can be zoomed. • Fixed a bug that GIF images and PDF files were not displayed in the thumbnail when displaying the page list. - Occurred from macOS Mojave Ver 10.14.3. Copyright © 2019 in-bluesky. All rights reserved.